The San Diego Gulls squandered a three-goal lead, but defeated the Ontario Reign, 5-4, in a shootout Saturday evening with Justin Kloos scoring the winning goal after having a goal and an assist in regulation. Ontario captain Brett Sutter sent the game into overtime by completing a hat trick with an unassisted goal with two minutes, 11 seconds left in regulation. Neither team scored during the five-minute overtime, where both teams play with three skaters, two fewer than normal. The Gulls outshot the Reign, 4- 0, in overtime. Both teams failed to score in the first round of the shootout. Ontario center Mike Amadio scored and Gulls left wing Kalle Kossila scored in the second round. Reign right wing Nikita Scherbak failed to score to open the third round. Kloos ended the game with a goal on the Gulls third-round shot. The Gulls completed their highest-scoring first period of the season on Chase De Leo’s second goal of the period and 19th of the season to take a 4- 1 lead with 24 seconds left in the period. The Gulls had scored three goals in the first period six previous times this season. The Gulls scored four goals in a span of 11:34 beginning when a pass by De Leo from behind the net bounced off an Ontario defender and past goaltender Peter Budaj 8:02 into the period. Kloos scored an unassisted goal off an Reign turnover in the neutral zone 1:07 later. Kloos and Kossila assisted on Jack Kopacka’s power-play goal at 18:03 of the first period. Ontario scored both goals in the second period. Left wing Sam Herr swatted the puck out of the air and into the net 1:46 into the second period for his eighth goal of the season. Sutter’s power-play goal at 17:18 of the second period ended the Gulls team-record 30 consecutive penalty kills. Sutter, a son of former Los Angeles Kings coach Darryl Sutter, who guided the team to the Stanley Cup in 2012 and 2014, opened the scoring 1:19 into the first period when he put in a rebound of a shot by Scherbak for his 17th goal of the season. The Gulls led in shots, 38-37, including a 17-11 advantage in the first period, before a crowd at Pechanga Arena San Diego announced at 12,534. Gulls goaltender Kevin Boyle made 33 saves, improving his record to 22- 9-1-0, extending his team record for victories in a season and the personal high in his three-season professional career. The previous high was 19 in the 2017-18 season. Boyle also assisted on DeLeo’s second goal for the first point of his professional career. Budaj (7-9-4-2) made 34 saves. The Gulls scored on one of four power-play opportunities. They were scoreless on a five-minute power play in the second period when Reign right wing Matt Luff was called for spearing, receiving both a major penalty and a game misconduct. Ontario scored on one of its two power-play opportunities. 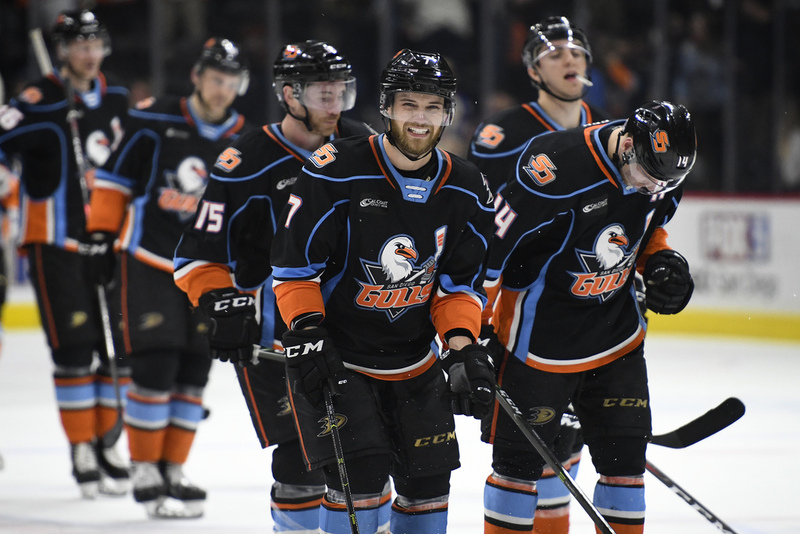 The victory moved the Gulls (33-20-4-3) two points ahead of the San Jose Barracuda (32-19-3-4) and Colorado Eagles (33-24-4-1) in the race for second place in the American Hockey League‘s Pacific Division and the home-ice advantage in the first round of the Calder Cup playoffs. The Gulls have eight games left to play in the regular season, San Jose 10 and Colorado. The Reign, the Los Angeles Kings AHL affiliate, are last in the seven-team division with a 22-28-6-3 record. The Gulls NHL parent club, the Anaheim Ducks, announced earlier Saturday they had recalled right wing Kiefer Sherwood and center Sam Steel from the Gulls. The Gulls will continue a four-game homestand Wednesday against San Jose.